I am really excited today to introduce you to Amy from H is for Handmade. She is absolutely darling, she has fabulous taste, and she is extremely kind. I've been following her blog secretly for a while now and I really love it. She has an insanely cute tutorial for you today. Welcome Amy! Hello friends of I am Momma Hear Me Roar! It is a complete honor to be featured in Cheri's Refashionista event and I am really excited that it's now my turn to show you a tutorial! 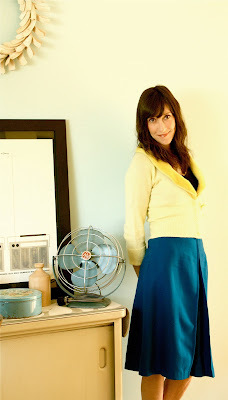 I wanted to choose an item of clothing to refashion that I thought would be accessible to most women - something that they would probably already have in their closet: A simple and basic sweater. I bought this sweater awhile ago from a thrift store for $4.00 because I loved the color. The construction and material were in good shape and it was very clean and hardly worn. I knew I could easily work with it to add a little extra something and give it a bit more character. Intorducing the Scallop Collar Cardigan! (eat your heart out Emma Pillsbury! First, turn your sweater inside out. You will want to cut a 2 inch wide strip of interfacing to the length of your sweater and place it down the front and middle of your sweater. Use an iron to press it on. This will be useful for 2 reasons: 1) it will keep the weave of your sweater from unraveling. 2) it will help prevent the sweater from stretching or loosing it's shape when working with it. It's important to keep the sweater in it's natural state when pinning and sewing. Next, cut down the middle of your sweater to open it up like a cardigan. Set it aside. Take various sized dishes and put a piece of tape on 2 sides. Make a line with a pen or marker on the tape to show where "half" is, making sure the line is visible from the bottom of the plate. Line up your marks with the straight edge of your fabric (or on a straight line that you have measured out) and trace around your plate with a pencil or chalk. Cut out your scallops. You will have to make a "guesstimate" of how many scallops you want and at what size. This will vary depending on the collar of your sweater, the size and how you want to place them. Play with it and see what works for you. Note: 2 pieces make 1 scallop. To make 1 scallop, place two of the same size and same fabric pieces with rights sides together and sew only on the curve. After your scallops have been sewn, turn them right side in and use an iron to press flat. If your fabric allows, use steam or a spray bottle to dampen the fabric to get it as flat as possible. You are now ready to place your scallops around the collar of your sweater! Pin them as you go. I overlapped mine and also gave it an asymmetrical look. For the scallops that are being placed just around the curve of the collar, you will want to cut a curve in your scallop, as well - making it more of a crescent shape. When all the scallops are placed and pinned to your liking, you can now sew them around your collar and sweater opening. After your scallops have been sewn on, you are now ready to pin on your bias tape. Start at the bottom of your opening and work your way around. Be sure to leave a few inches on the ends to fold the bias tape under the bottom of your sweater for a more finished look. Sew the tape around your sweater. You can sew a strip of the bias tape together (shown here) and cut it into two pieces and sew the ends of each strip to the inside of the sweater to make a tie...or you can use a hook and eye closure, a button and loop, or whatever else you think would complete your refashion. You are done! How does it look?! Thanks in abundance to Cheri for introducing me on her fab blog! This was so much fun to be a part of and I loved taking on the challenge! Happy refashioning to you all! Thanks so much Amy! Be sure and check out H is for Handmade. If you liked this tutorial I bet you'd really like this one too. Feel free to leave her a comment here and then head on over to check out her place. See you tomorrow! Thanks Amy. You did a fabulous job, and I learned some great tips. I'm sitting here smiling and thinking what a clever girl you are and brave enough to cut a sweater open.. Yikes~! I see that the bias tape that you put there will hold everything together. This looks so good.. I'll bet you get lots of compliments..
Ta Ta For Now..from Iowa,,sunny and 45 degrees.. wonderful day. Very clever sweater re-do! I always get a rush cutting into clothes...maybe our choice of drug? ;) Very nicely done, Amy. supper,I love it.thanks for sharing. I love this and will try it ! Thanks so much! Really, really cute. Way to go Amy! love this and love amy!! *Gasp! * I love it! I have to make one! This is so cute! I will be making this! That's so pretty and eye catching! Thanks for the how-to, I'll be linking. This is absolutely adorable! Thank you so much for sharing!